Inside Out and Back Again: A Harper Classic (Hardcover) | Let's Play Books! Winner of the National Book Award, a Newbery Honor, and a #1 New York Times bestseller! Inspired by the author's childhood experience as a refugee—fleeing Vietnam after the fall of Saigon and immigrating to Alabama—this coming-of-age debut told in verse has been celebrated for its touching child's-eye view of family and immigration. This Harper Classic edition includes an author's note explaining how and why Thanhha Lai translated her personal experiences into this book, an interview with the author, an activity you can do with your family, tips on writing poetry, and discussion questions. 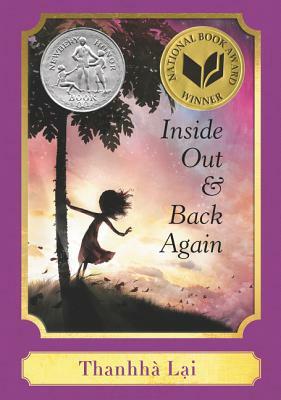 Inside Out and Back Again is the moving story of one girl's year of change, dreams, grief, and healing. This book was named to multiple state lists, received four starred reviews, and was hailed as a best book of the year by Publishers Weekly, Kirkus, School Library Journal, and the Chicago Public Library.